It's a known fact nutritional supplement ads are boring. It's a known fact most coupon-style ads are boring. What's not known is the fact, in advertising, two boring things can, with a twist, become very unboring. That's what Draft/FCB Chicago has accomplished with its campaign for Optimum Nutrition Pro Complex APS. In order to redeem the coupon in this ad for a free sample of the product, the reader must not simply tear out the coupon but tear the entire magazine requiring 240 pounds of force. The ad appeared in the June 2007 issue of Flex. 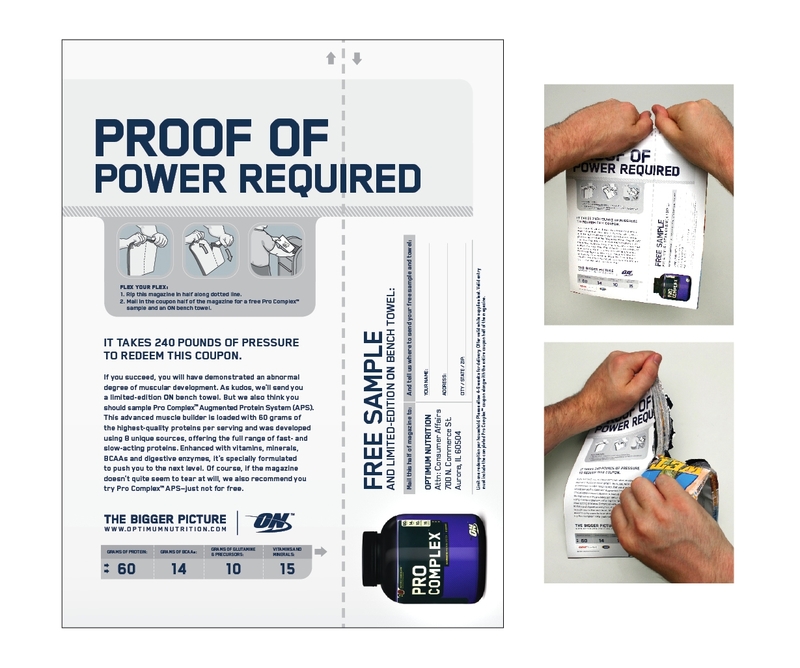 For those who can't seem to muster the strength required to rip the entire magazine, Optimum Nutrition is happy to send a sample of Pro Complex APS...as long as the requesting party is happy to pay for the sample. What about an opt-in approach to online advertising. Take a look at www.prowebsurfer.com and what they are doing - replacing ads with images, including (bizarrely for some users) replacing ads they don't want with ads they do (especially vintage ads). Its the next step in user-generated content. Take a look and watch the "replaced ads" count build up (currently about a million ads per month). Smart execution. Simply done. I do wonder if anyone will actually mail it in, but good try anyway. Good work from Draft/FCB - and man do they need some.